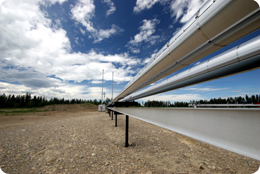 Over the past six years, Hydraulic Analysis Limited have been involved with the design and optimisation of a number of long distance pipelines in both Russia and China. The Chinese Oil Industry is constantly pushing the boundaries of pipeline operation with multi product pipelines which deliver batches of fuel from costal refineries into mainland China. These schemes are at the forefront of pipeline design and technology and are hydraulically very challenging projects due to their complexity and near infinite operating configurations. We are fully committed to the Chinese market and identified the potential growth of this sector at an early stage. Due to the increasing number of Chinese projects which we are winning, we now have two full time representatives in Beijing who handle the sales and client liaison aspects of our Chinese projects to enable us to work closely with the designers/owners/operators. Due to the high static lift of the Chinese pipelines, they are often constructed with numerous booster stations (it is not uncommon for a single pipeline to contain up to 20 separate inline booster stations). In addition to this, there are often several distribution stations along the pipeline which abstract flow from the pipeline for local distribution. Consequently, the fluid inventory is constantly diminishing along the pipeline which necessitates a staged reduction in pipe diameter. It is also essential that temperature changes are accurately modelled along the pipeline as this will have a significant effect on the fluid volumetric flowrate. Our software is capable of accurately modelling the effects of temperature change along the pipeline and we can produce temperature profiles as part of the model output, if pipe wall and soil heat loss coefficient data is available. Our real time simulators are also capable of modelling temperature tracking along the pipeline (www.ssl-int.com). A typical project would involve the distribution of high and low octane gasoline and diesel along a pipeline on a batched principal. The refinery would normally be located on the coast and the products will be pumped inland a total distance of up to 2500 km (with a typical elevation increase of 2500 metres). There will be as many as 20 inline booster stations between the refinery and the end destination with storage facilities at each station to enable quantities of the product to be abstracted from the pipeline and delivered (via road tanker) to local communities. This operating principal allows fuel products to be transferred into remote areas of China without relying on a highway infra structure from the coast. As fuel is continually abstracted from the system along the route of the pipeline, the net flowrate delivered to the end user is just 7-10% of the initial input flowrate. As a result of this, the pipeline diameter continually reduces along the route in order to reduce CapEx costs and also ensure sufficiently high velocities along the main. One of the more challenging aspects of these design studies (asides from the requirement to install dedicated surge relief equipment at each booster station to keep the surge pressures below the pipeline pressure ratings), is the requirement for the pipeline to remain operational if several booster stations were to shutdown. This often requires the careful calibration of any pumping station discharge pressure control valves so they are set to override to suction pressure control if an upstream booster station were to trip. This is necessary to prevent any issues with vapour formation or slack running along the pipeline. We are able to offer significant CapEx and OpEx reductions to our clients by optimising the MAOP ratings of the pipeline sections and by configuring the pumps so there is the minimum head burn across the pumping station PCV’s.